Bats are the only flying mammals. Finland has 11 known species of bats. Most of the species hibernate in Finland, although a few of them migrate to the south. According to the Nature Conservation Act, bats are protected. They are also under the strong protection defined in the appendix IV of the EU nature directive, and protected by several international agreements. If you are considering getting rid of bats in your building, you should first contact your regional Centre for Economic Development, Transport and the Environment, which will provide further instructions. All Finnish bats are insectivores. They hunt in the dark with the help of the echoes of the high-pitched sounds they make. Each species has its own typical sounds. The bats form an exact image of their environment through the echoes they hear. Bats can hide in attics during the day time, and may, thereby, cause some disturbances. Bats living in the attic may also bring in common bedbugs and their guano may cause odour problems, so their access to the building should be blocked by obstructing their access routes. Bats can crawl in through holes less than two centimetres wide. Their access holes are usually on the west and south walls of the building. Sometimes, the access routes can also be found due the staining around the hole or the guano underneath it. Nearly all bats leave buildings during the night time, which enables their access to be blocked while they are gone. 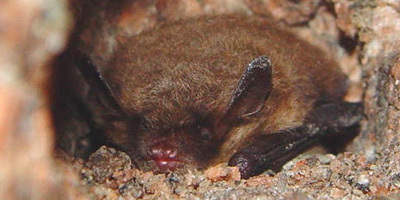 Bats cannot be evicted between May and September. Bats that come indoors in human residences are usually young individuals who have gotten lost. Most often, they will leave by themselves if a door or a window is left opened and other exits are closed. Bats are not aggressive and do not attack, but they may bite, if they get caught. Do not handle bats with your bare hands, as some of them may carry the rabies virus. Please note the copyrights: don't copy photos from this website for other purposes.